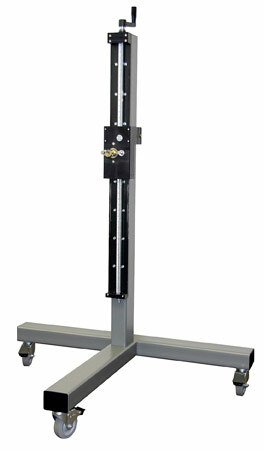 This rugged T-base stand is ideal for use with Weber's complete line of label applicators and label printer-applicators. 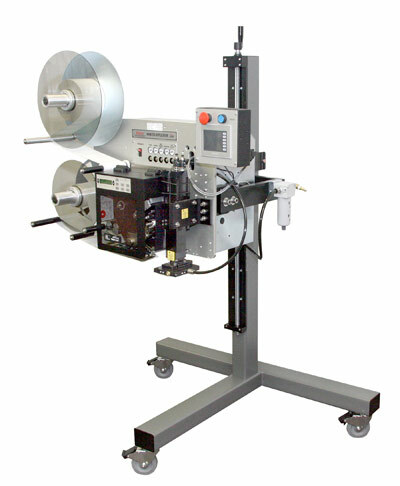 It will hold the heaviest load with ease and it balanced to keep your labeling system steady and stable. An applicator simply mounts to the stand via a U-shaped arm, which permits easy adjustments, making it possible to configure the applicator for top, side, or bottom product labeling. In addition, the applicator head can be positioned at various distances from a conveyor through the use of a gib-plate mounting. The heavy-duty stand, constructed of rugged tubular steel, also includes over-sized locking casters that make it easy for one person to move a labeling system to accommodate various conveyor lines and products. Optional features include a vertical column extension, gib-slide and yard arm for positioning applicators at selected increments from the stand's upright column. To meet specific requirements, a range of custom modifications is available.